Private Limited Companies: A Private Limited Company, also known as PLC is quite similar to public limited company but it can be run with just one member and it cannot offer its shares to the public, even if they want to.For a public limited company to start trading, it must have issued shares of value £50,000. 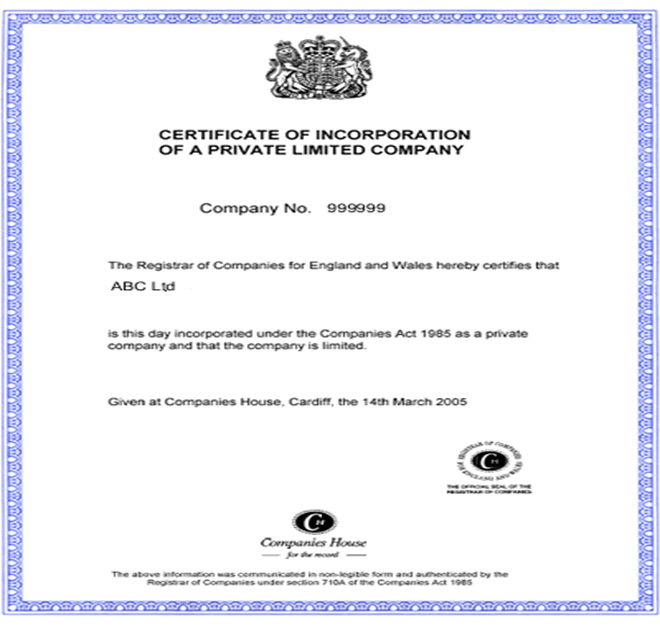 Is a separate legal entity incorporated with the Companies House under Companies Act 2006. Has its own share of finances which is separate from its owner's personal finances. Own its assets and can keep the profits generated after all taxes are paid. Limited Company – What are the advantages? At present, there are over 3.5 million limited companies incorporated in UK and is preferred over a sole trader or partnership structure. The private limited structure is a proven successful business model where the business owners hold all shares of the company. Forming a private limited company results in protection of personal assets;provide access to more resources, better financial assistance and greater tax cuts. It has Limited Liability: The biggest advantage of limited company is its limited liability feature. Limited companies are treated as a single entity and thus in case of any debts, company is responsible for it i.e. in case if a company is unable to pay its debts, the shareholders will have to pay as per their share of contribution (nominal value of their shareholding) which can be as small as £1. So, with the private limited structure, you can take more calculated business risk without the fear of losing everything to the uncertain and unexpected situations. Full registered name and address of your company. Name and addresses of directors and secretaries, if applicable. Detail of shareholders and capitals. Apart from Corporation Tax, which is mandatory for Limited Companies, you need to check if you have to pay other taxes like VAT, National Insurance Contributions, Capital Gains Tax or PAYE. How Do You Define Expense? A business expense is a cost which is incurred in an organization’s efforts to generate revenue. Expenses may be in the form of cash payments like payment of wages and salaries, depreciation of asset(s) or paying of bad debts. One should summarize all expenses and deduct it from the total income before assessing income tax. For business expenses, you can pay from your personal funds and claim it by submitting relevant receipts and documents. Claiming money spent by you as an expense will help in saving tax on it. However, anything and everything which you pay on the name of company/business expense need not be a valid business expense and thus cannot be claimed in case it is not a valid expense. Accommodation: Expenses incurred in accommodation, meals can be claimed as a valid business expense. Generally there is no fixed limit/allowance for accommodation, but your claim for the same should be of reasonable amount. Clothing: Cost of your everyday wear is not a part of a valid business expense. However, if you are required to wear a particular type of uniform or protective clothing then it can be classed under valid business expense. Pre-Trading Expenses: There are certain expenses which you have to do prior to setting up the company like meeting clients, phone bills or equipment costs. In case these expenses are made within 7 years of your first day of business and have a reasonable cost, you can claim them as your business expense. Home-Office Costs: In case you spend most of your time at your home office, you can claim a percentage of electricity bill, broadband charges, telephone bill, metered costs of gas and water. However, if you are using your home-office only for paperwork and accounting, you are allowed to claim only £4 per week with regard to utility bills. Pension Contribution: For the year 2017/18, you can claim tax relief on your annual pension contribution up to £40,000, or up to 100% of your earnings, whichever is lower. i.e. if you have earned £25,000 in one tax year but have placed £40,000 extra in your pension kitty, you can claim tax relief only on £25,000. Childcare: As an employee or director of your limited company, you can claim a percentage of your childcare expenses. In order to claim the expenses easily, you can tie up with an approved child care provider and link the payment to your limited company bank account. Computer Equipment and Software: Costs/expenses incurred in purchase or maintenance of computer equipments, hardware and software can be classed as a valid business expense provided value of each item is equal to or is less than £1,000. In case it is above £1,000, it will be treated as capital expense and you cannot claim it. Accountancy Fees: In case you have made any payment to your accountant as a part of your business, you can claim it through your limited company. It does not include any type of payment for your personal tax. Annual Work Event: In case you are hosting an annual event on behalf of your limited company, you can claim the expenses through it provided these conditions are met: i) Event was hosted in that tax year ii) It was open to all the employees in the company iii) maximum cost per head does not exceed £150, including VAT. Eye Tests: If you are required to work in front of laptop/monitor or any kind of display screen for at least an hour on a daily basis, you can have your regular eye tests paid by your limited company. However, the test results should mention that the prescription is for display screen work only. Stationery and Printing Costs: Stationery and printing costs such as postage, stationery supplies, printing and printer ink etc can be classed as a valid business expense and can be claimed through your limited company. Professional Memberships: In case you are a part of a professional or trade association and it is of an advantage to your business, you can claim this cost against corporation tax. Health Insurance: Medical and Health insurance can be classed as a valid business expense and can be claimed through your limited company, however the policy needs to be a specific Permanent Health Insurance (PIH) Policy. This policy needs to be in the name of your company and payments are done through the company bank account. Working as a director or an employee to your company gives you an added advantage of claiming valid business expenses through it, which you may not be able to do through an umbrella company. However, you need to claim your business expenses to save tax on your earnings because tax is incurred only on the profits so your business expenses should be deducted from your total earnings for you to understand your finances better. For example, if you have earned total £5,000 in a month and have incurred £1,000 in business expenses then you have to pay tax on £4,000. However, you need to consult your accountant for a more detailed picture and for accounting other factors like VAT, PAYE, and Dividends etc. In order to claim the expenses, it is extremely important that a contractor keep hold of all receipts of expenses incurred in order to make a claim. This is imperative, as HM Revenue and Customs can decide to investigate a contractor; hence, having evidence of all the expenses incurred while hold handy. Contractors can contact DNS Accountants for any assistance.